The water-only initiative began earlier this year when the school decided to look at becoming water-only. The school approached their Health Promoting Schools Advisor, Siaosi Mafi for advice and support. “We noticed many children coming to school with sugary drinks and we knew this was not beneficial for their teeth, their weight, their behaviour, or their learning,” says Karla. 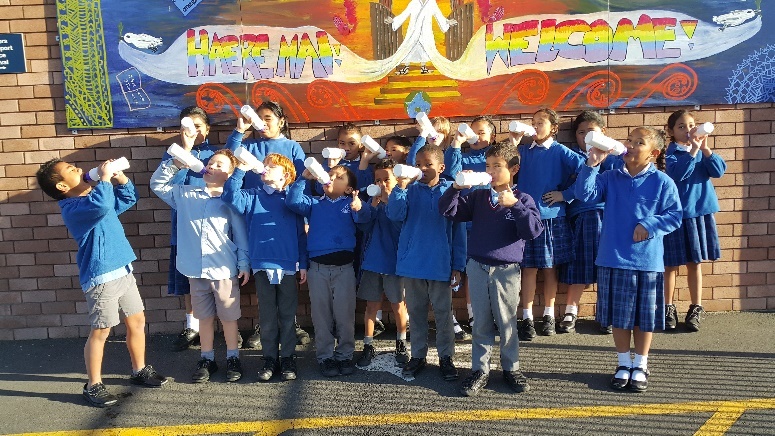 To show our commitment to encouraging our students to drink more water, we kicked off by raising awareness on the health benefits of drinking water. With support from the Heart Foundation we set up a large display in our school foyer showing the amount of sugar in various types of drinks. We then asked parents to show their support by asking that children only drink water at school. After that, we had a visit from Rowie Szeszeran-McEvoy of Max Fitness College, who came and taught the students five simple ways to be healthy. One of these was drinking more water. Regional Public Health donated drink bottles to each of the students and the school had water filters installed at the drinking fountains. “Feedback from parents has been extremely positive. This is just the beginning for us. Along with the water-only initiative, we have also improved our fitness programme. Students can now exercise for longer period and are more active in the playground,” says Karla. Another lesson the students have learnt from fitness coach Rowena was to ‘eat more stuff that comes out of the ground’. The school has recently begun its very own vegetable garden. Students have built the garden beds along with designing and constructing frames to keep pests out and planted a variety of vegetables. Next term students will harvest, cook and eat the vegetables they have grown. Photo: Seventh-day Adventist school students show off their water bottles to promote the water-only message. Last updated 12 February 2018.